Typically, river cruise ships on the Mississippi and other American waterways follow the same design: lots of wood and brass with traditional American furniture and decor that evokes the Mark Twain era. American Duchess, the third vessel for American Queen Steamboat Company, breaks the mold, to a degree. While the 166-passenger ship still has the white wedding cake exterior of a traditional paddleboat -- and a working paddlewheel that does add some speed to the vessel -- its interior is refreshingly modern and contemporary. The airy design comes from the ship itself, which originally served as a gaming boat with lots of open space. American Duchess is wider than other ships in the AQSC fleet at 100 feet, and has ceilings on each floor that are 18.5 feet tall. When you walk into the ship, the spaciousness is immediately apparent and it's highlighted by atrium staircases that go up two floors -- 37 feet in total. Large Austrian chandeliers provide formality, while Murano glassworks add a colorful contemporary touch. The dining room is equally dramatic, with floor-to-ceiling windows that rise two stories, letting in light and providing views. To create a public space with intimacy, the line built a mezzanine level that sits in the center of the main dining room. This room, called the Lincoln Library, has its own bar and grand piano; it's intended to serve as a gathering place for groups and as a second entertainment venue. The open space also allowed the line to create the first loft suites on American rivers. These rooms, which are a whopping 550 square feet, have a sitting area with a sofa bed and full bath on the first floor and steps to a semi-private second floor with another full bath and queen bed. These suites, as well as two other high-end cabin categories (Owner's Suites and Deluxe Suites) have private balconies; a standard veranda cabin has access to a walk-around outdoor area. The company hopes that the ship's more contemporary look will appeal to affinity groups, such as university alumni and Road Scholar gatherings, and younger affluent passengers, while the line's other ships -- American Queen and American Empress -- attract steamboat traditionalists. While American Duchess certainly looks and feels more luxurious and contemporary, it lacks features -- such as a pool or spa services -- that appeal to younger baby boomer passengers. This being the first season American Duchess is on the river, we did experience some issues we expect to be resolved as operational and facility issues are fine-tuned. 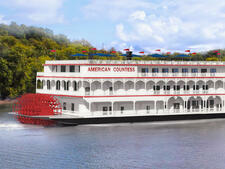 On the whole, American Duchess represents something new for U.S. river cruising. The ship resembles an airy luxury hotel rather than a traditional, nautical steamboat, and as such deserves attention from cruise enthusiasts, those interested in U.S. rivers, and frequent cruisers looking for a more contemporary experience. 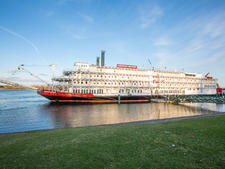 American Duchess is the smallest vessel in the American Queen Steamboat Company Fleet, and carries the highest fares. 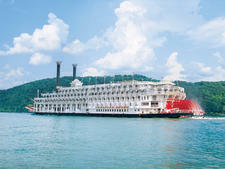 As a whole, American Queen Steamboat Company attracts passengers with an interest in the history and culture of the American South, be it the Civil War, music or some other regional element. On the American Duchess, passengers come seeking the luxurious, spacious suites and the Commodore services available at the two highest cabin classes. On our sailing, passengers were exclusively Americans, though Canadians and Europeans have also been on the ship. While most passengers were traveling independently, there was a small charter group onboard. Daytime dress on American Duchess is casual, and passengers are urged to pack for comfort. Walking shoes are essential for tours and excursions. In the evenings, the line suggests "country club casual," with a dress or dressy skirt/pant and blouse for women and a collared shirt and slacks for men. Be mindful to dress for the air conditioning in Southern states, so bring a sweater or shawl to combat cold air on the ship and on excursion busses. In winter, be sure to pack an extra layer or two as temperatures on excursions can vary day to day, and on our sailing, they were working out some heating issues, which left the boat a little chilly. Men may wear sport coats, but they are not required. Shorts are not allowed at dinner in the main dining room. American Duchess includes the following in its fares: a one-night hotel stay before the cruise, with breakfast, taxes and transfers to the vessel; a hop-on, hop-off bus shore excursion in every port; city tours in some ports of call; wine and beer with dinner; coffee, tea, soda, cappuccino, espresso and bottled water and Wi-Fi. Transfers to and from the airport are not included. Premium shore excursions are available for purchase in some ports. Fares do not include gratuities. Tips of $17.50 per passenger per day will be automatically charged to your onboard account. A tip of 15 percent is levied on drinks and wine purchases in the dining room. The currency used onboard is the U.S. dollar.